Facebook Messenger lets you do much more than chat. 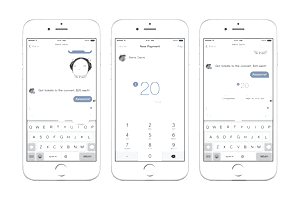 In addition to sharing files and organizing group events, Messenger enables you send payments to friends and request funds from anybody who owes you money. You have several options when it comes to sending money online, so why use Facebook? If you spend a lot of time in Messenger, it may be your most convenient option. What’s more, for group expenses, you can split the costs with numerous people in Messenger. For example, if a group discussion led up to an event, you can pay members of that discussion. Facebook Messenger payments are free whether you send or receive. You need to fund payments with a bank-issued debit card, but can also use a credit card or Facebook gift card to fund payments. You must be over 18 years old to use the feature. You must be friends with the person you pay or receive funds from. Messenger payments are available in the U.S., France, and the United Kingdom (in pounds) and France (in Euros). You can use Messenger on your desktop or make in-app payments from a mobile device. Sending money with Facebook is about as easy as sending a private message. Messenger app: In Messenger, start a conversation with a friend that you want to pay. Find the "$" icon above your keyboard, tap it, and enter the amount you want to send. Hit "Pay," and the money is on its way. If you don’t see that icon, look for a plus sign, which should provide expanded options. Desktop computer: Open or start a conversation with the friend you want to pay. Find the “$” icon to begin the process described above. Your first payment: To use Messenger payments the first time, you need to provide funding information. It’s easiest to submit this information as you go through the process of making a payment. But you can also add or change funding methods by updating your payment settings. Enter your debit card number and any other required information to get set up. During this step, you also have the opportunity to set up a personal identification number (PIN), which helps prevent unauthorized payments. Choose a code that is hard to guess and that nobody else knows. Because Messenger uses your debit card, money will come out of your checking account almost immediately. Make sure you have sufficient funds in your account to avoid overdraft charges, bounced checks, and other problems before you make a payment. If somebody sends you money through Messenger, you'll get a notification. If you don't already have debit card information on file, you need to provide card details to accept the payment. Once that's done, funds will go to the checking account linked to your debit card. Facebook does not hold onto the money, but your bank might take several days to show the payment in your account. If you need the funds to be available for spending immediately, Zelle might work as an alternative to Messenger payments. You might already have Zelle set up through your bank, and payments clear quickly when both banks work with Zelle. Are Facebook Messenger Payments Safe? Fraud: You can’t cancel Messenger payments (although recipients can voluntarily reject them if you make a mistake). Plus, the money comes out of your account immediately. Facebook does not advertise any type of consumer protection, and you are not supposed to use Messenger for business payments—including buying on eBay or craigslist. Con artists may take advantage of confusion on this issue, as they have with Venmo, Zelle, and similar services. Account security: To protect yourself, establish a PIN for Messenger payments (or Touch ID, if available on your device). You have the option to opt-out of that additional step, but why take the chance? Data security: Payments through Messenger are about as safe as any other app or online service. Facebook hired David Marcus in June of 2014, the former head of PayPal, in preparation for Messenger payments (so you would expect industry-standard security). Facebook claims that all payment information is encrypted, including your card number and details about your transaction. Facebook stores that data "separate from other parts of the Facebook network," and the company dedicates additional resources to watch for fraud. Privacy: Privacy cannot be ignored. If everything is already on Facebook and you’re not concerned about that, a bit of your financial information might not matter. But data can be mined and analyzed in surprising ways, so be mindful of how you send and receive money. In group payment situations, all members of the group can see payment amounts—so pay one-to-one if that matters.